Villas Nizuc, Villa 26 è un condominio in stile condominio con tre camere da letto splendidamente decorato, ben tenuto, situato sulla spiaggia nella zona degli hotel di Cancun. La zona degli hotel di Cancun è considerata di livello 2 SICURO per i visitatori dal Dipartimento di Stato degli Stati Uniti, al pari di Inghilterra e Spagna. Non esistono restrizioni di viaggio. Nel 2014 abbiamo effettuato una ristrutturazione totale di $ 320.000 della villa. Praticamente tutto nella villa è nuovo, dentro le mura e nelle zone giorno. Ogni camera ha il proprio bagno completamente privato con doppio lavabo e doccia inclusa, una cassaforte di tipo hotel e un balcone con splendide viste sulla spiaggia e sull'oceano e / o sulla laguna. C'è anche una grande cucina completamente attrezzata, sala da pranzo e soggiorno al piano terra. Riceviamo la maggior parte dei canali TV americani, incluse le reti principali e abbiamo lettori CD e DVD e un sistema stereo di fascia alta. Ci sono oltre 3000 piedi quadrati di spazio vitale per il vostro divertimento. C'è la connessione WiFi in tutta la villa La villa si trova proprio sulla spiaggia principale della zona alberghiera di Cancun, con una splendida vista dei Caraibi da praticamente dappertutto dentro e fuori la villa e dal nostro patio privato e balconi. Siamo situati tra gli hotel Westin Regina e Sun Palace a Km. 20 su Blvd. Kukulcan, la principale e unica strada della zona degli hotel. La nostra cameriera di oltre 20 anni viene tutti i giorni tranne la domenica per pulire, fare il bucato e tenere la villa in ordine. Può anche provvedere a risolvere eventuali problemi nella villa. La cucina può essere organizzata, ma c'è un costo aggiuntivo molto ragionevole. LA MASSIMA OCCUPAZIONE DELLA VILLA È OTTAVO (8) PERSONE INDIPENDENTEMENTE DELL'ETA '. Se gli affittuari potrebbero avere visitatori che non soggiornano presso la villa, si prega di discutere la politica dei "visitatori" delle ville con il proprietario. Forniamo tutti gli asciugamani, compresi teli mare, biancheria, sapone per le mani e sedie a sdraio e ombrelloni per la spiaggia. Le uniche cose che gli ospiti devono portare sono shampoo e asciugacapelli personali e tutti gli oggetti personali come farmaci, telefoni cellulari, ecc. Le ville sono una comunità chiusa e ha 24/7 di sicurezza, un tuttofare, giardinieri, cura della piscina, pulizia della spiaggia e i giardini sono ben mantenuti. Siamo a pochi passi lungo la spiaggia da snorkeling e sono vicino a tutti i tipi di attività sulla spiaggia come parasailing, jet ski, ecc. Dato che siamo nella zona degli hotel, siamo vicino a centinaia di ristoranti, centri commerciali e porti turistici e a due nuovi supermercati in stile USA, ma le ville sono molto private e tranquille. Il parcheggio è vicino alla villa se noleggiate un'auto, e il servizio taxi e autobus sono tutti appena fuori l'entrata della villa. Se affittate il proprietario vi fornirà molte informazioni utili per rendere la vostra vacanza a Cancun una grande esperienza. La nostra villa è ideale per famiglie, coppie o amici che vogliono viaggiare e stare insieme. Le ville sono una sistemazione semplice e rilassante e NON sono adatte a chi vuole fare festa o bere molto. Poiché il costo è per l'intera villa, che può ospitare comodamente otto persone, è molto meno costoso rispetto al soggiorno in un hotel o resort all inclusive. Ognuna delle nostre tre camere da letto è fisicamente separata dalle altre e ha il proprio bagno privato, quindi c'è un sacco di privacy quando lo vuoi. Inoltre, dal momento che la zona giorno principale e il patio sono al piano terra non ci sono ascensori da prendere e nessuna lobby da attraversare. Si tratta di una passeggiata di 30 secondi per le 2 piscine, una delle quali è per i bambini piccoli, e un minuto a piedi dalla spiaggia attraverso i nostri meravigliosi giardini costellati di palme. Riceviamo molti affittuari ripetuti e se affittassi la mia villa una volta, è molto probabile che vorrai affittarla di nuovo. Tutti i bagni sono nuovi (2014) di marca, molto spaziosa e bella. More beautiful than the photographs! If I could give this villa 10 stars, it still wouldn't be enough. To begin, the condo is MUCH larger than the photographs indicate....the upstairs master suite consumes the entire length of the condo. The villa is SPOTLESS, and Guillermina and Roberto come every day to keep it that way -- they were delightful and spoiled us to bits. The views from the villa are breathtaking....the ocean is only steps away from the patio. Marty, the owner, is the most gracious host and went over the top to make our stay perfect. He compiled a brochure of where to go, what to do, how to get there, etc., which became our "bible" while were staying there -- thank you, Marty! This is the perfect location for those who want to be able to have a more private, peaceful location but still want to access to all the fun activities Cancun has to offer. We especially enjoyed the "jungle tour" speedboat ride.....a simple hop on the bus right outside the villa, and you can be anywhere in the hotel zone for $1. Of note, although this villa runs slightly higher per night than some of the others available, when we arrived, the villa was well stocked with plenty of towels, including beach towels, bottled water, drinks, condiments of all kinds, paper towels, tissues, etc. Guillermina, who is delightful, comes daily and cleans, does laundry, makes beds, etc. You will not get this kind of royal treatment anywhere else in the hotel zone. Thank you so much, Marty, for making our 20-year anniversary celebration so very special! We hope to come back again!! What a beautiful villa and location! We stayed at Villa Nizuc (Villa 26) two weeks ago and enjoyed every minute. The location of the villa is outstanding -- right on the beach and just steps away from the pool. The complex is on the main drag and the bus stops right outside the gate. You can walk from the villa to many of the shopping malls, hotels, restaurants or excursions or get to practically everything by bus--super convenient. Plus there is a Circle K convenience store literally across the street. So if you forgot to pick up soda pop, cookies, or tequila, no worries. Just hop across the street to Circle K.
The villa itself is beautiful--even more so than depicted. The first floor has the fully stocked kitchen, dining rooms (inside and out), a half bath, and the living room with a large screen HD television. My nephew and his best friend stayed up late playing their video games on the tvs. The second floor has two large bedrooms, each with its own bathroom and balcony. And the third floor has a stunning gorgeous, enormous master bedroom which I enjoyed during our stay. In the early morning I loved sitting out on the balcony enjoying a lovely, unobstructed, perfect view of the turquoise waters and white sand beach. And star-gazing at night is not to be missed! Marty was wonderful to work with--very accommodating and helpful . . , and I booked very late due to my travel schedule. Guiremina (Villa 26's housekeeper) was wonderful as well and kept the Villa in top notch condition. 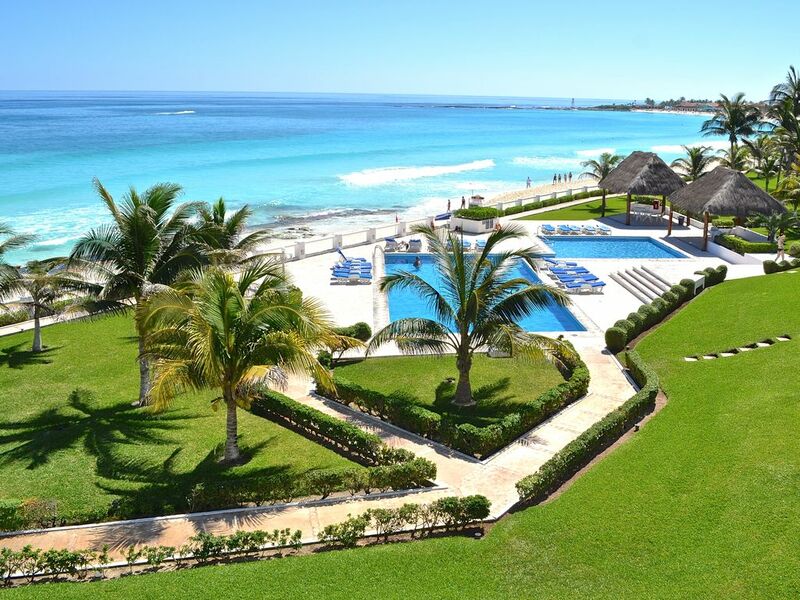 Without question the next time I visit Cancun I'll be staying at Villa Nizuc - #26.
my husband I and spent a week in Marty's condo with our 4 kids ages 17, 17, 15 and 11. We had an incredible time. The location was perfect, the condo was better than we imagined. We will definitely be returning in the future. From the time we arrived to the time we left, everything was perfect. Roberto and Guillermina are wonderful and so helpful!! Thanks for your 5 star review. I greatly appreciate your taking the time to do it & I hope you'll rent again sometime. * 3 large bedroom with plenty of space. Master bedroom is on 3rd floor and is wonderful and peaceful. Two sets of narrow, stairs that could pose a problem with mobility issues. * Beach and Pool are a 2 minute walk right out your patio door. Water is crystal clear. It was very windy when we were there so there was a lot of seaweed, but they cleaned it up as soon as the days got calmer. * The sea was very rough with riptides for the few days that it was windy. My 13 year olds loved the waves , but we stayed closer to the 8 year old. The last two days were very calm and there were no issues. * The sea breeze is wonderful. Barely used the air conditioner. * Beach chairs and umbrellas are right on patio for your use. There are no umbrellas at pool but we stayed on beach most of time. No crowds and you can walk for miles to check out the "riff raff" at the other resorts. * Guillermina and Roberto are wonderful. She kept the place spotless. She does show up everyday except Sunday around 930a and leave around 2-3. We didn't ever really notice her, but some people may not like this. They cooked for us one night and it was great. We had a car so we explored and ate out the other nights. Grocery stores are wonderful less than 10 min drive away. *Marty is great and provides tons of information for a great vacation. Thanks Dawn for your 5 star review, I greatly appreciate it. As for the stairs, I do want future renters to know there are handrails all along the 2 stairways & they are enclosed on the sides, granted people who might have trouble climbing stairs might find them problematic. There are no umbrellas by the pool, but there are 2 large palapas right next to the pool people can sit under if they want shade by the pool. Our maid, Guillermina, does come in everyday but Sunday to take care of the villa, but she will modify her routine if any renters want her to come less often. Everything was just as described in the description and as numerous others have commented. We thoroughly enjoyed our stay at VN#26 very much, everything about the accommodations, beach, pool, location and people taking care of the property was fantastic and could not be better for our family. The only thing I would comment on (and hope that others do not have trouble with) is the difficulty getting into the Villa the first day. There are guards who control access into the villas coming from the street and they had no idea we were renters staying at #26. Since they speak no English and our Spanish is spotty, it took a while for us to gain access on a Saturday afternoon. It was high anxiety as they told us that we would not be allowed onto the property. We had problems initially getting our phones to work in Cancun, so I could not call the owner for help. We were beginning to question that something was not right about the reservations but eventually, and inexplicably, we were permitted access. I don't know what changed the guards mind but after 20+ min trying to explain the situation and showing him the paperwork we were granted access and did not have any issues for the rest of the week. Perhaps this was an isolated case but others should be prepared for this upon arriving the first day. Villas Nizuc è proprio sulla spiaggia, nella zona alberghiera di Cancun tra i Westin Regina & Sun Palace Hotel sulla Blvd. Kukulcan a Km. 20. E 'vicino a oltre 100 ristoranti, grandi centri commerciali, porti turistici e tutti i tipi di sport acquatici e attività di canottaggio. Ci sono anche 3 campi da golf a pochi minuti della villa ed è possibile noleggiare campi da tennis in alberghi vicini. If you cancel your reservation, deposits and full payment will only be refunded if I can rent the dates you cancel. However, I will count any payments you have made toward any future rentals of my condo.